With six children, we have more than our fair share of special days. For example, we celebrate a collective eight birthdays a year, every year! And six children add energy and excitement to each special day that occurs. Christmas is the universal favorite special day. It gets a resounding buildup each year, starting with decorating the house on November 26th. 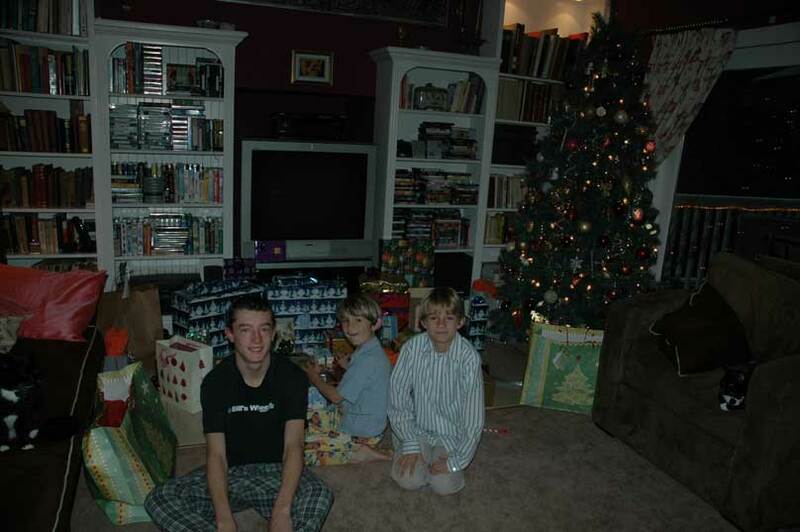 On the right, the sun has yet to come up on Christmas morning 2005, but the throngs are gathering to open their presents. Alban, Alex and Charles swallowed their impatience (Alex barely) to pose for the camera. Even Snip joined in, delighted to have company so early in the morning. She is at the right of the photo on the armchair! 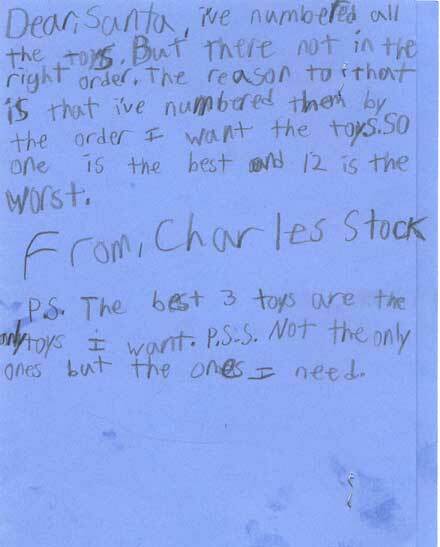 For several years, letters to Santa have been painstakingly prepared by the little guys. On the left is the letter that Alex sent to Santa in 2005, and a part of Charlie's is on the right. 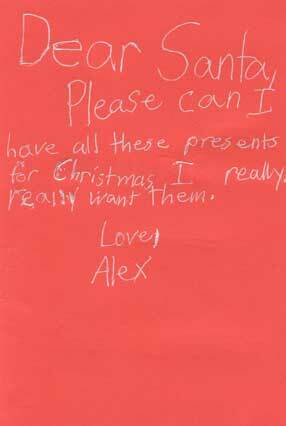 The back of Alex's card finishes off this endearing literary collection. 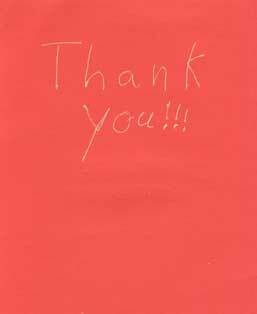 Thank you, Alex and Charlie! 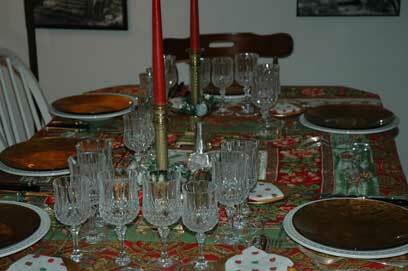 Below left is the table laid for Christmas Eve 2005, when the Hanlons came over for Christmas dinner. The dining table is often central to special days. Coming a close second to Christmas in our house is Halloween. Costumes are planned for months in advance: in February 2006, Charles had already started looking for pieces for his 2006 costume. Then there are Valentine's Day and Thanksgiving and Easter. There are birthday parties hosted by other families for their children. Those special days just keep coming! There are even parties for parents and other adults. Ian's 50th birthday party was a blast for all. Halloween 2004 at Barry and Bobbi's was also a lot of fun. 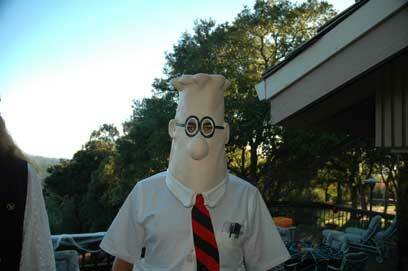 On the right is a well-known Silicon Valley engineer, Dilbert, whose pants were too short in person too! And below, a group of Happy Valley friends at the same party. 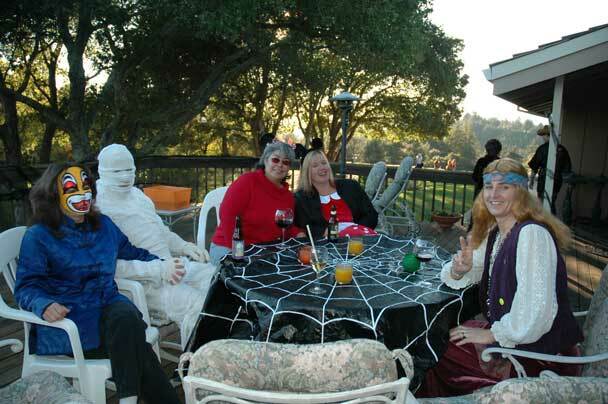 Marty was the mummy, Susan a bug, Christine Minnie, and Judy a hippy.  There's another photo of Judy here.